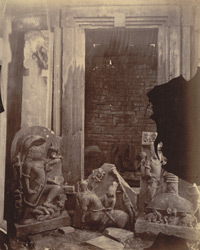 Photograph of sculptures at Pathari, taken by Joseph David Beglar in 1871-72 and described in his 'Report of a tour in Bundelkhand and Malwa, 1871-72; and in the Central Provinces, 1873-74' (A.S.I. vol. VII, Calcutta, 1878), pp. 76-77, 'Close to the embankment and north-east of the great temple stands a group of ruins of several temples and pillared halls; the principal one appears to have consisted of a court-yard surrounded on three sides by pillared halls with an entrance on the west flanked by two small temples...The statues inside are numerous; there are, in fact, all the ten avatars of Vishnu except the fish; the tortoise incarnation is remarkable..."
Kurma (Vishnu as tortoise) is at the right (negative damaged in this portion of print), Varaha (Vishnu as boar) on the left, Kalki (future incarnation of Vishnu, on horseback) is at the centre of the photograph.